Ecology is studied at different levels: individual, population, community, ecosystem, biosphere (these pictures are from a different text). Understanding interactions may help in the removal and/or preservation of species in different areas of the biosphere. 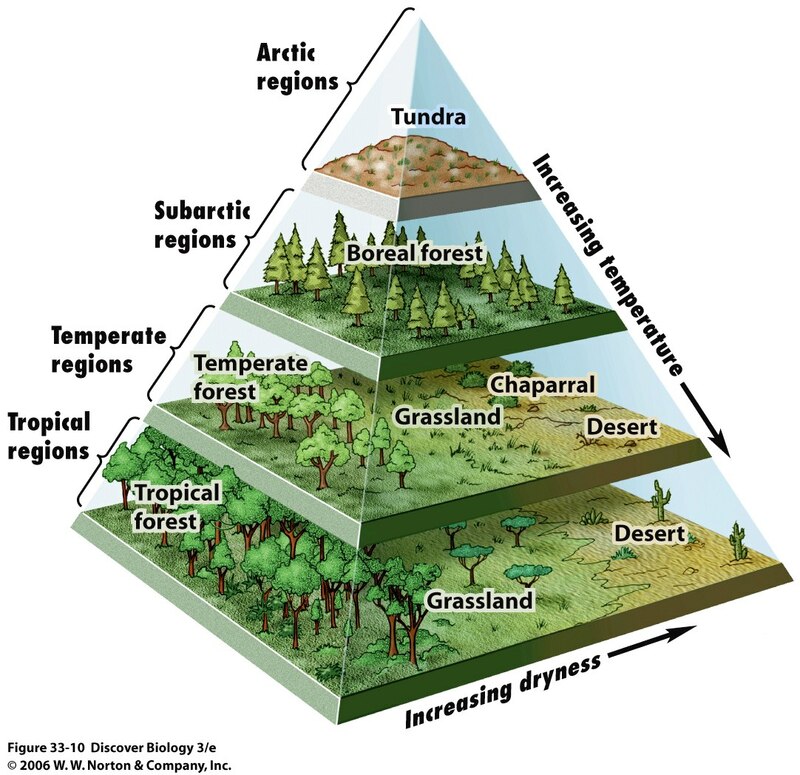 Biomes are different kinds of ecosystems (your text calls them life zones), are associated with different physical conditions, and include different kinds of communities that have become adapted to those physical conditions and each other. Over the next 4 lectures you will be learning about ecology. Ecology is the study of ecosystems, which are collections of living and non-living things and their interactions. Biomes are similar kinds of ecosystems found around the world; biomes are characterized by their physical conditions (e.g. soil, rainfall and temperature throughout the year) and the communities of organisms that interact in these conditions. 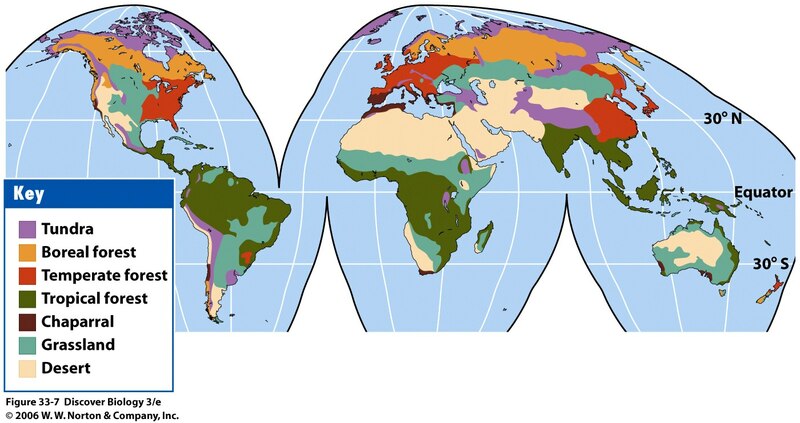 Different biomes are found at different latitudes of the earth and small scale examples can be seen at different elevations in an area. I have selected 5 different biomes that you may have seen as you drive along I-80 from the Sacramento region, up the west side of the Sierra, and over to the east side of the Sierra: grassland, wetland, chaparral, temperate conifer forest, and desert. You will need to form 10 groups of 4-5 students. Each group will present a poster on one of these biomes; there will be two posters on each biome. The posters will give you a chance to exercise your creativity, reinforce some ideas about ecology, and help your classmates learn about different kinds of biomes. You will have a chance to display them, to view other groups’ posters, and to ask and answer questions about the posters on Friday, May 11, during the first half hour of lecture. You will be given 10-15 minutes this Friday, next Monday, and next Wednesday to work on your posters. This time will probably be spent best planning (on Friday) and then assembling (next week) the poster. Some of the poster work will have to be done outside of class, so be sure you agree on what each group member is responsible to do. · What are the distinguishing physical conditions (e.g. soil, climate or average seasonal patterns of temperature and rainfall) for your biome? · What is an organism that occupies each trophic level in a food chain (producer, primary consumer, secondary consumer, tertiary consumer, decomposer) in your biome? · What is an example of a mutualistic relationship in your biome? · What is an adaptation that a common animal in your biome exhibits, and how does that adaptation increase the animal’s survival and reproduction in that biome? · What is another interesting fact about your biome? ü Clear, interesting, and effective presentation of information to other students. All group members will receive the same score unless peer evaluations indicate that a student contributed much more or much less than others in the group. Below is a list of the biomes for the posters, as well as some common plants and animals found in those biomes in California. There is also a list of potentially helpful websites, since it will be difficult to answer the questions just using your text. Please cite any references (including websites) that you use. Populations are individuals of the same species, living and interacting in an area. 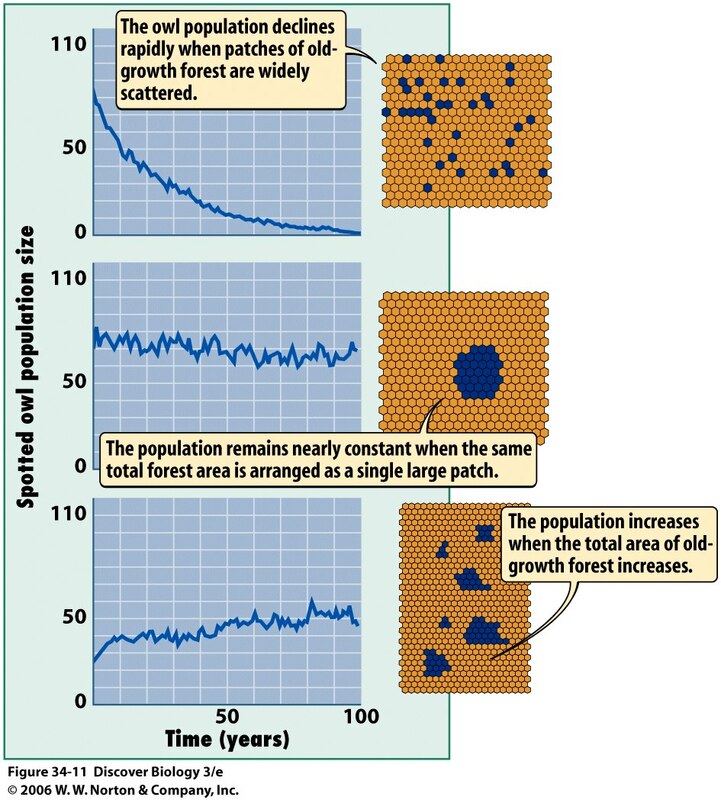 How fast a population grows (population growth rate) is affected by the environment as well as the life cycle times of the species. immigration = # individuals moving into the population and emigration = # individuals leaving the population. 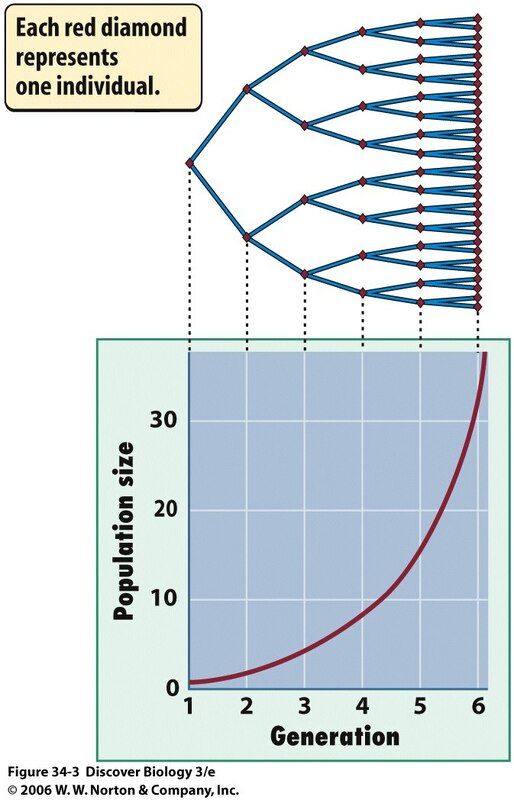 Most natural populations are capable of rapid growth, called exponential growth, where the increase is proportionate to the existing population and produces J-shaped growth curves. Limited physical resources + interactions among living things do not allow endless exponential population growth. Carrying capacity = the maximum # of individuals that an environment can support. 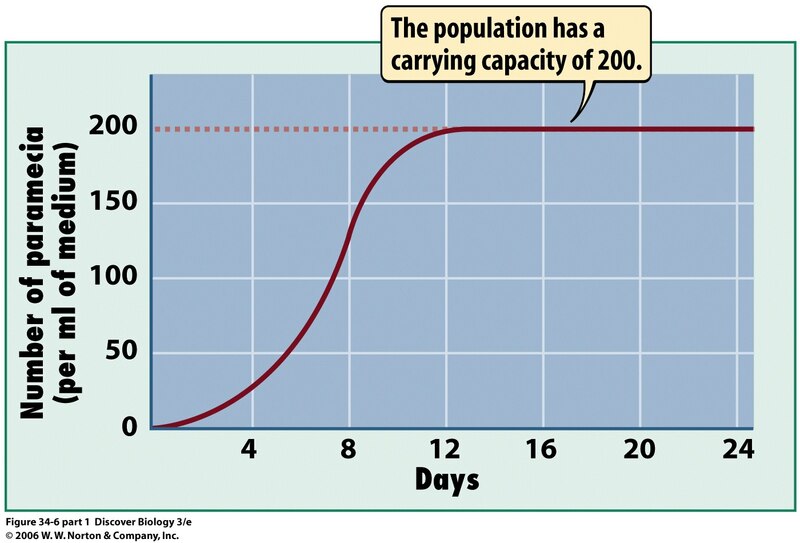 What happens to the population size and growth rate when the carrying capacity is reached? 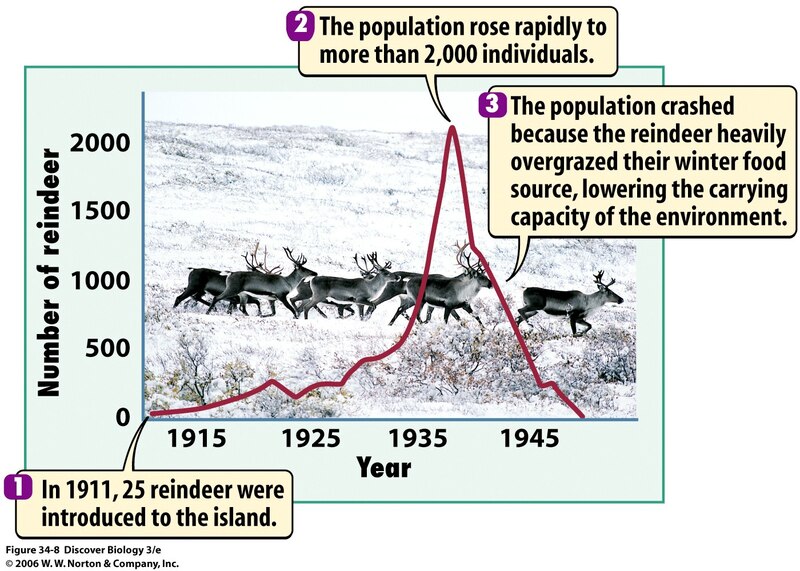 What are factors influencing the carrying capacity and limiting population growth? Is there a carrying capacity for human populations? Common Mutualistic Relationships: How does each partner benefit?